Twickenham is a sleepy little village on the Thames, located on the periphery of London's sprawling suburban mass. It is charming and rustic, with a slightly other-worldly air. It is the kind of place you expect old people to retire to -- close enough to the city to commute when necessary, yet away from all the hassles and noise. Yup, it's a quiet sort of place. So as you sit one summer's afternoon throwing lumps of stale bread to the swans in the river, your reverie is suddenly disturbed by the howl of a big four coming on cam. Not what you'd expect in this area really, but it was coming closer all the time and intruding upon the placidity. Round the bend comes a black 900 Honda with the letters RC emblazoned in orange across the tank. As it winds swiftly away, vanishing out of sight around the next bend, you note that it looked somewhat different from the standard bike, but you can't place exactly what it is. It seemed to have undergone a subtle metamorphosis, an indefinable refinement of the original concept. You walk away, puzzled, still trying to place the missing piece of the picture. And then it comes... there were no rear shocks. This is where Gerry Speechley comes into the picture. He is the artist who wrought in the oh so subtle alterations, and the cantilever monoshock FZ Honda is his personal transport. He lives in Twickenham, and spends his working hours as a boffin at the National Physical Laboratories in Teddington. You may not have heard of the place, but to put you in the picture, it's where or all the national standards are kept and measured, and they have a whole lot of special equipment to gladden an engineer's heart. Items like flow benches, dynamometers, wind tunnels and intricate sophisticated machinery that will let you do just about anything you please to an engine -- providing you have the technical ability to use it. Gerry bought the bike new in March ‘79, and was fairly satisfied with it in its standard form. It was fast, handled reasonably well and was reliable. But he wanted something a little different. 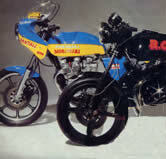 His last bike had been a blown 750 four, and he’d got the tinkering bug from that. So it wasn't very long before he decided that it was time for a change, and started playing about with ideas for modification. The rear end of the Honda seemed to be its weakest link, especially the suspension. The standard FVQ units were reasonable, until they started working hard. Then they would get hot and live up to their name -- Fade Very Quickly. After toying around with conventional aftermarket dual shock absorbers units, Gerry decided they were still too much of a compromise, since they were restricted to performing within the limits of the original design. So he dumped the conventional setup and proceeded to design his own rear end. Essentially, he was looking for greater wheel movement, and he wanted to use a large single shock to control the bumps. The cantilever was almost a natural selection, since it seemed the most feasible alternative to be accommodated within the existing frame. Before fabricating the swing-arm, Gerry spent some time playing around on a drawing board. Since he didn't want to relocate the swing-arm pivot, he chose to get the extra wheel travel by dropping the arm below the horizontal. This lifted the entire back end, shortening the trail at the front, but it did get 2 1/2 inches more wheel travel than the standard units allowed. Bearing in mind that he wanted practical everyday transport and a bike that was thoroughly streetable, he designed the rear suspension to cope with two 15 stone riders, and luggage. 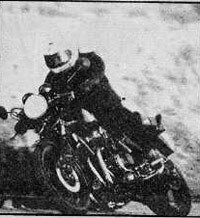 Thus he evaded the narrow strictures a racing type monoshock would impose upon the bike's practical use. It had to be compliant, control the bumps, keep the power on the road and still be comfortable enough to go touring on. This made some heavy demands on his own ingenuity, and the rear suspension. He finally chose a large De Carbon unit with 11 way adjustable damping (with four possible damping ranges), 10 possible spring rates and infinitely adjustable spring preload. The swing-arm was fabricated from box section metal, which is pretty rigid stuff and offers greater resistance to crumpling under extreme loads than tubular steel. It is fully triangulated in every profile, and pivots on taper roller bearings. The frame has been braced at all the main loading points and high tensile steel bolts have been used for the shock mountings. Offering optimum strength and resistance to flex, the mounting for the shock is at the 90° apex of the triangle.. There have only been a few minor alterations to the front end. 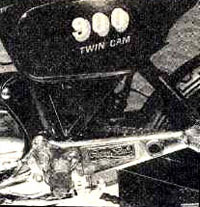 The telescopic units were fitted with heavier duty springs (1 inch shorter than standard) and air caps were fitted to the tops. The forks are pumped up with nitrogen, usually between 10 and 20 psi. Gerry favours nitrogen because it is moisture resistant. A slightly heavier weight damping oil was used -- Bel Ray SAE 20 -- since the overall increase in the stiffness of the front and needed more control.. The original Comstar wheels were junked in favour of cast magnesium Dymags, because they were stronger, lighter and wider. They also look better. Both wheels are out 18 inch diameter, but the front is 60 mm wide, and the rear 80 mm. The low-profile Michelin tyres just about complete the picture. The smaller diameter front wheel decreases the trail still more, accentuating the lift at the back, so making the bike's steering feel very quick with a pronounced tendency to dive under itself in corners. However, that problem is now in hand, since Gerry has made up an extended lower triple clamp to bring the trail back to standard. The disc brakes have all been drilled to reduce unsprung weight, and the calipers mounted ahead of the fork legs to aid cooling. All the brake hoses were replaced with stainless steel Goodridge Aeroquip hydraulic lines for added safety in durability. Handlebars are Tomaselli adjustable clip-ons, which bring the riders weight forward and aid high-speed comfort. 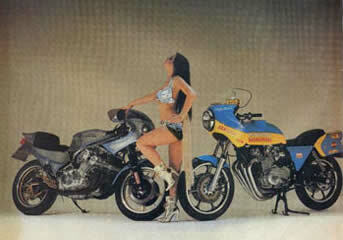 A Gold Wing headlight was substituted instead of the Cibie, as Gerry felt it had a better beam. There were a few snags with the build though. After neatly mounting the standard battery box on the left of the cantilever swingarm, Gerry dropped the engine back into the frame, only to find that the chain passed directly through the battery. The electrics are now powered by two smaller 12 V batteries, one located behind the left-hand side panel and the other under the detachable seat hump. Aside from such minor headaches, the bike went together very smoothly. Having sorted out the frame to his satisfaction, well almost, the next step was to modify the engine. To say the least, the 900’s mill has been extensively (and expensively) worked. When Gerry set out to modify the motor he decided to let the engine realize all its potential power, without making it work too hard. He didn't want an engine that was impractical on the street, yet it had to produce enough ponies to be a very exciting ride. This was done by lightening most of the existing components in the motor, replacing those prone to stress failure with stronger items, punching out the holes were the slugs went up and down and allowing the motor to breathe more freely. A host of smaller mods, like shimming up the oil pump for increased flow pressure and adding a bigger oil cooler, were carried out in the interest of reliability and durability. To appreciate what has gone into the power plant, a glance at Gerry's £2220 shopping list might help: The pistons, which increased the displacement to 1093 cc, are special modded Asso items and clock in at £136. These were subsequently replaced with the American MTC items. The new cylinder liners were specially made to Gerry's own specifications and set him back £133.40. The carbs were 29 mm smooth bore Mikunis, a snip at £232, but are now 34 mm Amals, and the longer duration cams were a mere £200. These ride atop modified and hardened inverted buckets, which conceal Honda car shims riding on the valve stem tips. Because Gerry felt that the weakest point in any white metal bearing engine is the split conrod, he rushed off to Russ Collins for a set of gold anodized heavy-duty aluminium items (£234). While he was browsing through the catalogue he also decided that a heavy-duty eight plate clutch would be a good investment at £57, and threw in a £121 four-into-one exhaust system. 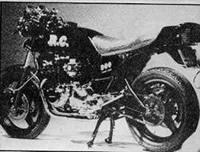 A set of heavy-duty springs to go with the clutch were supplied by Action Fours for £8, and some stiffer valve springs -- originally destined for CBX -- were supplied by RC engineering. After the crank had been lightened and the head gas flowed, he assembled the whole plot. A friend made up a special hand cut head gasket from 1/16 gauge copper, and it was annealed to soften it before the head was bolted down. The compression ratio was initially 10.6:1, but to overcome cold starting problems he amended it to 9.6:1. Throw in all the items on the chassis such as wheels, tyres, clip-ons, shock unit and headlight, as well as the cost of materials used in fabrication, and the bill gets pretty hefty. But Gerry says the loot has been well spent, and feels the project is now nearing completion. That's the trouble with these specials, the work is never over. The bike has been on the road almost continuously while it was undergoing modification, and there have been one or two mechanical failures during that time. When the engine was first modified with specially lightened gudgeon pins, one of them failed causing a nasty mess. Problems occurred with the standard con rods as well, which resulted in chunks being knocked out of the extra long liners. On the way back from France this summer an exhaust valve melted. This was due to the carbs being improperly set-up and some prolonged enthusiastic throttle work. On the whole, considering its high state of tune, the bike has proved fairly reliable. I took the bike out for a brief spin, prior to the latest modification, and I was impressed. The power band has a very widespread, starting around 4000 rpm, and pulls cleanly to the redline, even in top. The chassis felt very taut, and the steering was sharp and precise, if a little marred by the tendency to dive into bends. Hopefully, once Gerry has sorted the motor and got his new triple clamp in place, I'll be able to take it for a more thorough ride.